I want to dedicate my episode reviews in general to the Claire Fraser to my Brianna. My brave and fierce mother who is celebrating her birthday this very weekend. I only have one question for the amazing woman who gave me life, love, and incredible stories about her time as an Air Force Lieutenant Colonel. Why didn’t you warn me this show would rip my heart out? I thought you loved me, mother. How utterly naive I was! I just want Claire and Adawehi to be friends forever. It’s such a lovely episode opening watching them teach each other words in their own respective languages. Adawehi teaches Claire about an herb she can make into a tea for pregnant women and asks Claire if she has children. Their cabin is complete! A pig is playing with Jamie’s hat. I want to try Fraser jerky! I bet it’s damned delicious. Jamie frets over leaving Claire alone while he and Young Ian head to WC to recruit more settlers. I’m sure everything will be just fine, Jamie. Claire never finds trouble when she’s alone. Jamie asks if Brianna has a birthmark on her neck. Claire is shocked that he knows about something she never told him. Jamie says to her he saw it in a dream. I’m living for all these moments where Jamie goes into papa mode. Roger is frantically searching for Brianna in Inverness. It’s entertaining seeing him in the place where it all began. The parallels between Roger and Frank searching for their missing lasses are hard to ignore. Roger finds a kindly innkeeper who says Brianna stayed at her inn, but that she left nothing behind save for a letter that our ginger princess left for her to send to Roger a year later. I love the recurring melodic theme that always plays in Roger/Brianna scenes. I’m wondering if it’s their love theme or a theme for Brianna herself. Jamie and Young Ian split up, determined to recruit Scottish settlers. Jamie knocks on the door to Mr. McNeil’s house, the town silversmith. His wife is apparently okay with her husband being out of town after getting one good look at Jamie. Claire helps a cute neighboring German family deliver a little bairn. New mother Petronella fondly says that her child looks like her late husband. ‘Do you have a grandchild Frau Clara? Jamie isn’t having much luck convincing his fellow Scots that he literally wants to give them free land. Gotta up your pitch game, Jamie! Nobody’s biting at the offer. Brian explains why everyone is so hesitant to take Jamie up on his offer. They had land but were soon criminally overtaxed by Tryon’s tax collectors. Herr Mueller tells Claire he’s always welcome at their home. Petronella is adorable and tells Claire that she’s named her baby after her. Grandpapa Mueller goes from a sweet family man with a doll from town for his new grandchild to angry white man upset over Indians ‘stealing’ water from ‘his’ creek. It’s unfair that they have to move. The Cherokee are even classy enough to bless the water regardless. Herr Mueller automatically assumes they’re cursing the water. This won’t be a problem at all. I’m still in denial. It’s fun seeing Claire do things on her own. I like that she just doesn’t sit around waiting for Jamie to return. I AM ALL FOR CLAIRE’S DOMESTIC ROUTINE. Jamie says he’ll protect any settlers from any unfair taxation. Sure, Jamie. And I’m the queen of England. HOLY MOTHER OF BLESSED SILVER FOX MURTAGH. What a perfect way for Jamie to find his godfather again. 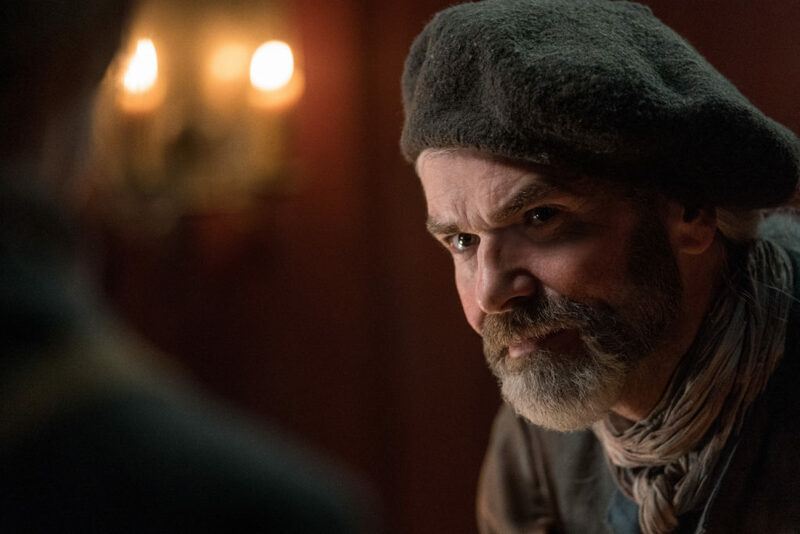 I know now that Murtagh died at Culloden in the books, but I felt it was an excellent choice to keep him alive in the show. It’s a great tie to the past seasons while still moving forward to Jamie and Claire’s future. Good ol’ Murtagh, stubbornly refusing to help Young Ian mend the broken bit for their return trip back to home. Jamie yells at the blacksmith-he-doesn’t-know-is-Murtagh for overcharging Young Ian. They go from yelling to hugging. The look on Young Ian’s face is priceless. Meanwhile, Claire faces frightening news. Petronella and the baby have perished from the measles. The pastor warns Claire to stay away from Herr Mueller, who thinks Claire allowed the Indians to curse the water. Claire preps herself and the musket for the worst. Murtagh tells Young Ian and Jamie that he was seriously considering killing the man he was an indentured servant to. Jamie gushing about Brianna attending university is the most adorable thing ever. Murtagh does not take Jamie up on his offer to join him at Fraser’s Ridge. He also explains to Jamie that he fervently believes that Tryon has unfairly taxed so many settlers. Jamie will have a hard time convincing any of the Scots to join him no matter what he offers. ROLLO IS SO GOSH DARN CUTE TRYING TO PROTECT CLAIRE. WHAT A GOOD BOY. Murtagh takes Jamie to a meeting full of angry overtaxed Scots. Tonight we drink to the tax collectors. Murtagh is quite the revolutionary! He rallies the men at the meeting to fight back against the tax collectors. I have a feeling he might just be on the winning side this time. But you know, I could be wrong. “A gathering of this size could get violent. It’s interesting how Jamie and Murtagh both make requests of each other, and both say no. Jamie refuses to join in with Murtagh’s band of merry pre-revolutionaries. He has a family to look over this time. Jamie is truly a man of his word, but he certainly won’t do anything to stop Murtagh’s men either. Spoken like a politician Jamie! Meanwhile, Claire is just having so much fun nervously clutching her musket. Herr Mueller forces his way inside the cabin. I don’t blame Claire for keeping her musket firmly pointed at Mueller. She only drops her guard when Mueller breaks down. Kudos to director Denise Di Novi and writer Bronwyn Garrity for doing a masterful job of having the audience fall for two red herrings in this episode. Claire was never in danger. Then as if that wasn’t enough, Herr Mueller hands Claire a package that she assumes to be Baby Clara’s doll. Claire was never in danger. Adawehi was. Seeing Claire open the wrapping to see Adawehi’s scalp has to be one of the most disturbing scenes I have EVER seen on this show. What’s even more disturbing is that Herr Mueller is genuinely perplexed and defensive about Claire’s horrified reaction. Claire was only saved from his wrath because of her whiteness. Claire can barely contain her fury and coldly bids Herr Mueller a good night and GTFO. She treats Adawehi’s heart with the reverence it deserves. Just when I think it can’t get any worse…. The Cherokee tribe spray the Mueller house with a barrage of flaming arrows. Herr Mueller’s wife walks out of the house seemingly alive, only to collapse a second later with a flaming arrow in her back. Honestly, I didn’t feel sorry for Herr Mueller when he was shot by a flaming arrow. The two real victims were the two elderly and kind women whose only crime was to be caught in the crossfire of hatred and vengeance. Of course, Jamie returns the next morning. Good timing! The next scene is an ABSOLUTELY WELCOME RESPITE from the chaos. I loved Murtagh whistling cheerfully as Claire slowly turns around to see him. It is so comforting to see Murtagh. Roger, if you’re reading this, it means I couldn’t make it back. The same melodic theme that played when Claire first discovered the magic of Craigh na Dun plays as Brianna makes her way to the same stone that took her mother back to Jamie. Please don’t try to follow me Roger. Resolute in her mission, Brianna touches the large stone as her mother once did and the camera pans around the stone and there we are! SHE DID IT. BRIANNA DID IT. HOW AM I SUPPOSED TO WAIT ANOTHER WEEK TO SEE HOW SHE FINDS JAMIE AND CLAIRE AND ALSO HOW ROGER FINDS BRIANNA BECAUSE, OF COURSE, HE’S GOING TO FOLLOW HER SOMEHOW? Thank you for introducing me to Outlander mother of mine. Happy happy Birthday! Until next week Outlander fans! This entry was posted in Bear McCreary, Bronwyn Garrity, Caitriona Balfe, Denise Di Novi, Duncan Lacroix, Episode Reviews/Recaps, John Bell, Richard Rankin, Sam Heughan, Sophie Skelton, Tantoo Cardinal, TV Show Clips and tagged Bear McCreary, Bronwyn Garrity, Caitriona Balfe, Denise Di Novi, Duncan Lacroix, Episode Clips, Episode Reviews/Recaps, John Bell, Marie Hacke, Nicola Ransom, Richard Rankin, Sam Heughan, Savages, Season Four, Sophie Skelton, Tantoo Cardinal, Urs Echn, Will Strongheart by Katherine Stinson. Bookmark the permalink.